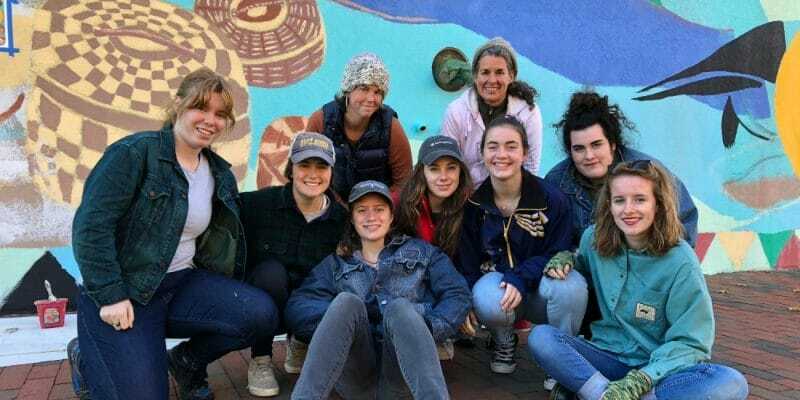 The young women of Maine Coast Waldorf School’s 11th grade class went to Portland on Wednesday afternoon, November 7th, to work with artist and MCWS parent Abigail Gray Swartz on her mural “Hidden Figures.” The piece celebrates three renown women artists from this region. The students first learned about the project and the women who are celebrated. They then painted the baskets in the Mary Mitchell section of the mural and did a wonderful job! 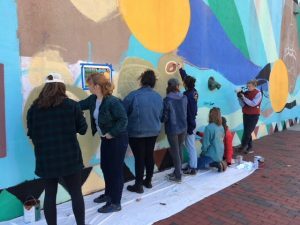 The mural is located on an exterior wall at artist studios Running with Scissors. 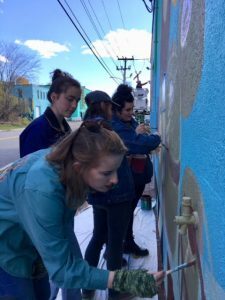 Abigail chose to celebrate three of Maine’s female artists, Dahlov Ipcar, Louise Nevelson, and Mary Mitchell Gabriel to reflect the artist studios. It was important to Abigail for the mural to depict diversity of artwork- from sculpture, to illustration, to basket making as well as diversity of origins. For example, Nevelson’s family immigrated to Maine when she was a young girl, and Gabriel is a Native American. Each portrait will incorporate images of the artist’s work. MCWS Dads Lit Up the Night (Again)!